Turning 21 in 2019, Australia’s most important cycling event is comfortable in its own skin, exudes confidence that comes with running a successful enterprise, and is unafraid to challenge the status quo. Rather than label it ‘Australia’s premier stage race’ or ‘Australia’s biggest bike race’ or something else, it’s probably best to call it for what it is: Australia’s most important cycling event. Because without a shadow of doubt, over the past 20 years, no shindig has done more to lift the profile of the sport in Australia than the Tour Down Under. 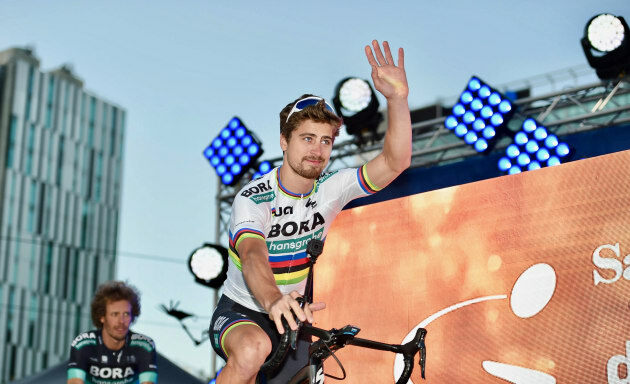 Peter Sagan is in Adelaide and ready to race his 4th Tour Down Under. In sport or, for that matter, any other field, it is the blue riband event and the marquee names that garner the most attention. From there, there is a trickle-down effect all the way to grassroots level. The example set at the highest bar, good or bad, therefore impacts everything else. It is why, in 2009, the presence of Lance Armstrong was such a coup for the TDU when he chose to make his comeback in South Australia, and why, post-confession to Oprah, it took a good few years to rediscover its mojo. Exactly one year before the Texan made his ultimately doomed return to professional cycling, the TDU became the first non-Europe event on the global cycling calendar, which since 2011 has fallen under the auspices of the UCI WorldTour. It therefore had a mandate to show not just the SA government but the governing body – indeed the sporting world – of its global reach. In 2008, when André Greipel beat boy from Bundaberg Allan Davis, who would win the year following, it was a boon for the TDU. 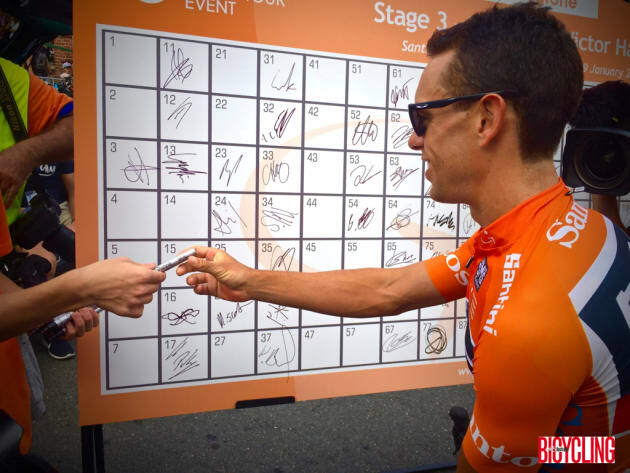 Race winner Richie Porte signs on at Stage 3 of the 2017 event. Image: Nat Bromhead. As was Armstrong’s presence from 2009-11 for a reported US$1 million appearance fee each time he came Down Under, despite rumours the US Food and Drug Administration’s top cop was onto him. After a repeat win by Greipel in 2010, the TDU saw six Australian winners in the next seven editions. They occupied many of the podium positions in individual stages, too – in the 2016 and 2017 editions, overall victories from Simon Gerrans and Richie Porte aside, the Aussies won every stage on offer! With the best teams obliged to ride every WorldTour event the level had stepped up considerably; yet many of the best foreign talent did not want to start too hard or too early, or come so far. The lure of warm weather or cameos with koalas was no longer enough. 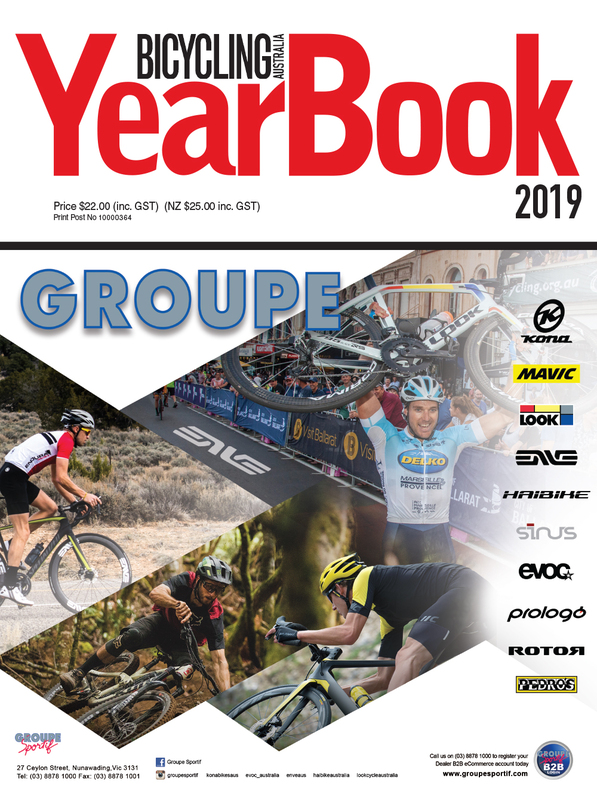 Race director Mike Turtur had no alternative but to get out the chequebook yet again, and to his credit, attracted the signature of the current most recognisable face and name in the sport. 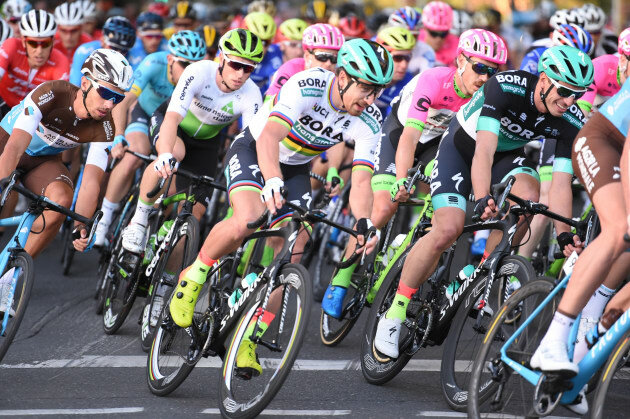 In 2017, Peter Sagan proved you can be competitive in January (at the TDU he finished second on three occasions), serious in the Spring Classics (he won Kuurne-Bruxelles-Kuurne), a stage winner at the Tour, and world champion at the end of September. As long as you timed it right, starting and finishing the season with a bang was possible. Little wonder Turtur brought him back – and will continue to try and do so for as long as he remains a racer, where his interest in Oz appears genuine (moolah aside). Prepare for some epic racing with daily backdrops like this. Last year’s 20th anniversary edition had everything organisers could’ve hoped for. Four-time stage winner from 2017, Caleb Ewan, faced far stiffer competition – “the best sprint field they’ve had in the past 20 years,” Matthew White, his then sport director, said before the start – and was beaten by Greipel (twice) and Elia Viviani. Even so, his single success in Stirling once again showed he doesn’t quite fit the mould of a pure sprinter. 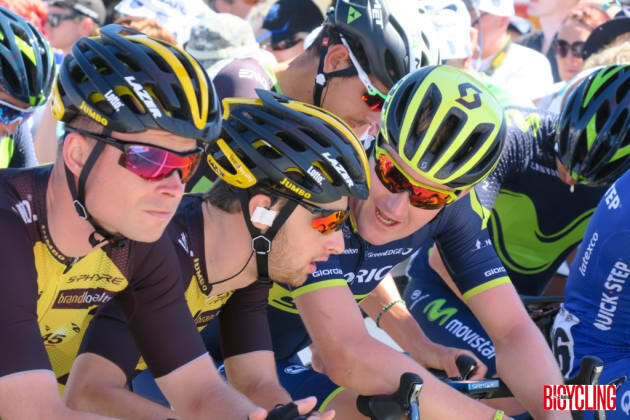 Orica-Scott's Luke Durbridge speaks with mates in the pro-peloton at a stage start in 2018. Image: Nat Bromhead. Uraidla came on the eve of the queen stage that since 2012 has finished atop Old Willunga Hill and for the past four editions had been won by Porte, the defending champion. Most rejected the Slovak’s claims when he said “Tomorrow is going to be a different story!” and that he would ride for his team-mate, Jay McCarthy – yet it turned out to be true. Alas for the man from Maryborough, he did not have the legs when Richie did his thing on the 2.9km ascent. For the fifth straight occasion, the Tasmanian was without peer as he left a decimated field in his wake. Only he found a most unlikely adversary in Daryl Impey, who gained precious seconds on the climb and went on to win the 2018 Tour Down Under. 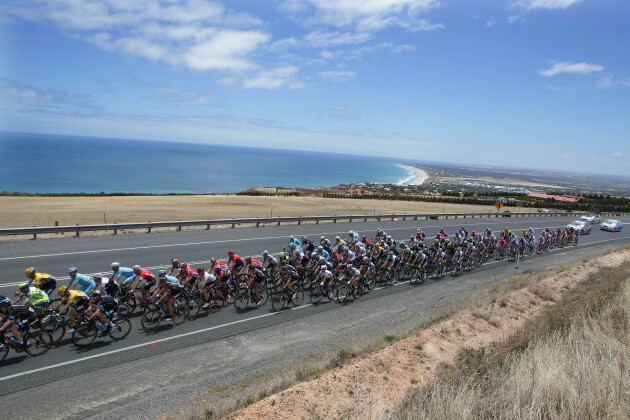 Since the Willunga stage became a hilltop finish, the race has never been decided on the final day. For the 21st anniversary it made sense to end on a high note, literally and metaphorically, instead of bookend the race with circuit races if one includes the traditional People’s Choice Classic opener in Adelaide’s East End. The boy has become a man... Have a happy 21st, mate. Also called the Down Under Classic, this exhibition-style opener is a criterium in Rymill Park in the city’s East End, a stone’s throw from the Adelaide Botanic Garden. Compromising 30 laps of a 1.7km circuit, the victor has always been a top-shelf sprinter – last year it was the rainbow-bedecked world champ, Peter Sagan. As the crow flies, less than 15 clicks separate start from finish. For the peloton, it’s east to the Adelaide Hills for their first KOM at Snake Gully some 40km in, then three spectator-friendly loops of a 11km circuit encompassing the towns of Paracombe, Inglewood and Houghton. ‘Tis a lovely day out... so long as you’re not racing the TDU and staring intently at the wheel directly in front of you! Once again, riders make their way into the Hills and the KOM comes early in the peace, this time at the oft-used Checker Hill, ticked off after 26km. From there, it’s a zig-zag path to a series of Barossa townships culminating in a likely sprint finish in Angaston – last used as a TDU finish in 2014 when Simon Gerrans beat André Greipel in a bunch sprint. On a stinking hot day, last year’s stage to Uraidla took in the climb of Norton Summit and decimated the field. This time there’s no Norton but with nearly 3,500 metres’ climbing it’ll be far from easy. A dozen or so kilometres after the Fox Creek KOM at 38km, the peloton embarks on a challenging circuit around the Hills. The 14km loop will be be tackled no less than six times. A worthy substitute for the popular Stirling stage of years past. 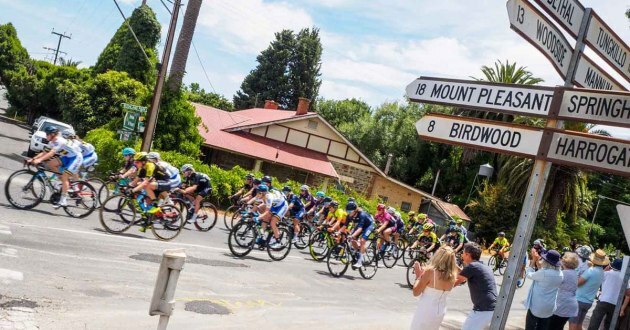 If you scored accom in the Adelaide Hills this week you clearly planned well: for the fourth day running the TDU returns to the 800 square-kilometre puncheur’s playground east of the capital. A pair of intermediate sprints in Echunga is as much limelight as the fastmen will get, for what lies inside the final 10km is the day’s pièce de résistance: the climb of Corkscrew Road. Last used in 2016, Gerrans displayed his versatility by outsprinting a group of 10 en route to a record fourth title. Two years before that, some guy called Cadel Evans went nuts on the 2.6km ascent and wasn’t seen till the winner’s ceremony. Those who signed up for the Challenge Tour will experience every nook and cranny of the penultimate leg of the TDU a few hours before the pros do their thing. With a 37.5kph average predicted for those who are paid to suffer for a living, should you end with a 30kph average or less, expect to spend a minimum five hours in the saddle. With just the Category 2 climb of Sellicks Hill the major topographical barrier for amateur and pro alike, pacing will pose the greatest obstacle. It’s generally referred as the Queen stage but in this age of #MeToo organisers have tweaked that epithet and have branded it the ‘King stage’. 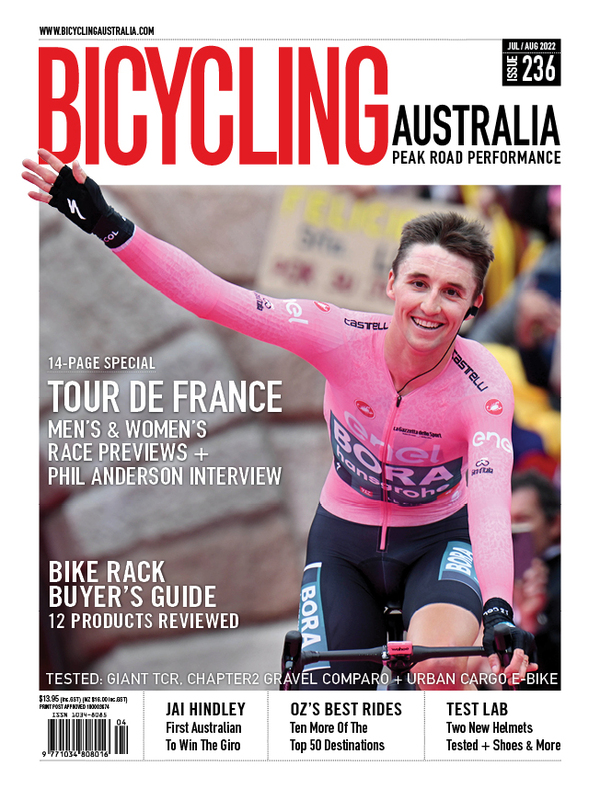 Whatever your fancy, one thing’s certain: the day will decide the overall winner of this year’s TDU – but not before three large loops of the McLaren Vale vineyards and two ascensions of Old Willunga Hill that for the past four editions has seen Richie Porte its master and commander. 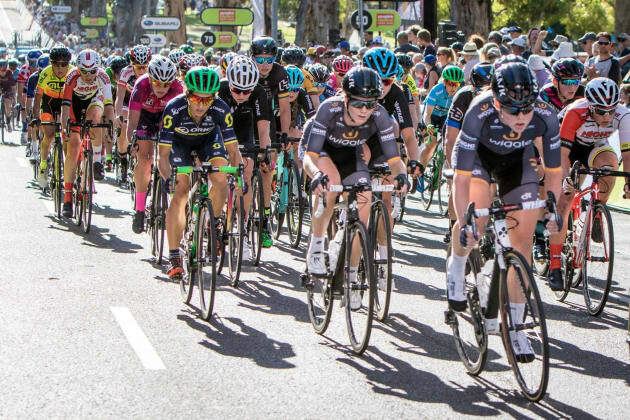 Returning for its seventh year, the Santos Women’s Tour Down Under will see World Tour teams from across the world coming together to compete in the hot, fast Adelaide hills and surrounds. The UCI 2.1 race will feature four stages taking place between 10-13 January. 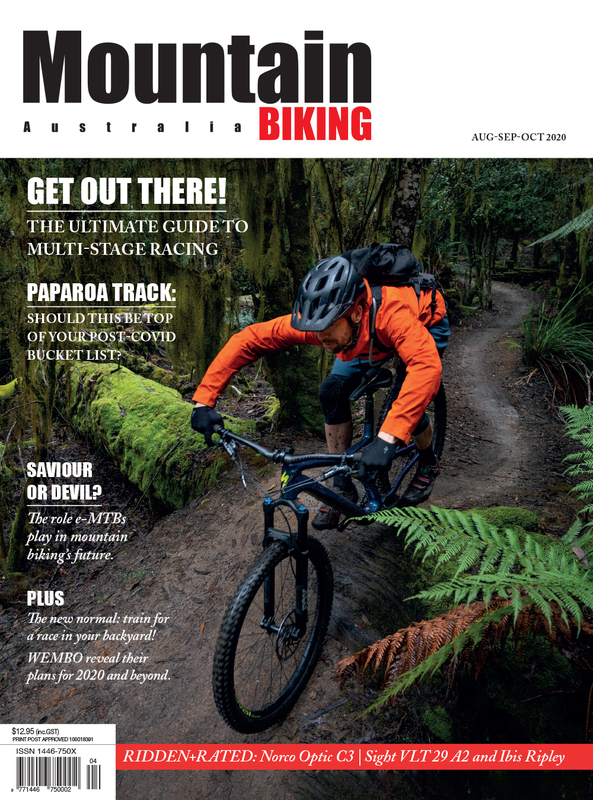 For the 2019 edition, the townships of Hahndorf, Nuriootpa and Nairne have been selected to feature as starting towns, with dynamic race routes designed to appeal to sprinters, climbers and all-rounders alike. Riders of Stage 4 of the 2017 Santos Women's Tour - again the final stage of the women's tour will be held on the People's Choice Classic criterium course in North Adelaide on Sunday afternoon. “Stage 1 will see the riders travel from Hahndorf to Birdwood and we expect a fast, bunch sprint,” says race director Kimberley Conte, “whilst the course for Stage 2 from Nuriootpa to Mengler Hill will see the climbers reign supreme on this Subaru Queen of the Mountain. “The beautiful and technically challenging Stage 3 course finishing in Stirling incorporates part of the famous circuit used frequently on the Men’s race,” she adds. For the second year, the event will also feature equal prize money for both the men and women. While total dollar amounts are yet to be finalised, the announcement for last year’s event was met with resounding praise. Who will take overall honours? Last years event saw 17 teams featured, with 102 riders from Denmark, Great Britain, Italy, Netherlands, New Zealand, the United States and Australia. After four stages it was Aussie, Amanda Spratt (Mitchelton-Scott) who came away with back-to-back wins (2017/2018), taking the overall classification despite becoming caught up in a crash during the final stage. No doubt she will have her sights set on a ‘third time lucky’ GC win at the 2019 edition of the Santos Women’s Tour Down Under. Starting in the ever-popular Adelaide hills area, Stage 1 from Hahndorf to Birdwood features an undulating course but is expected to finish in a bunch sprint. Points will be up for grabs on Lucky Hit Climb (Category 3) on Martin Hill Road at Forreston on two occasions as the riders loop through the course. The Charleston Ngangkiparinga climb (Category 2, 7% gradient) also features as a prominent place to grab some points towards the QOM classification. Arguably Australia’s top female sprinter, Chloe Hosking (Ale Cippolini) will be one to watch for this stage. Last year at the Cadel Evans Great Ocean Road Race she proved herself as not only a top sprinter, but someone who can also hang on when the road kicks up. Other potential riders to watch include Annette Edmondson, who took out Stage 1 of last year’s event, and 2018 National Road Race Champion Shannon Malseed (Tibco-Silicon Valley Bank). Stage 2 moves from the Adelaide hills to the Barossa Valley where the stage will kick off in Nuriootpa before finishing up Mengler Hill (Category 1 ascent at 9.96% gradient) – a feature of last year’s second stage, which was won by UniSA-Australia’s Katrin Garfoot. Despite the uphill finish of Stage 2, the peloton is set to only briefly test out their climbing legs up Three Cols (7% gradient) just outside of Eden Valley. Last year’s event saw UniSA-Australia’s Katrin Garfoot and Mitchelton-Scott’s Lucy Kennedy battling it out on Mengler Hill, with Kennedy losing out to Garfoot’s kick in the final 300 meters. With Garfoot retiring, Kennedy is once again a favourite to take the stage, alongside teammate Amanda Spratt. New Zealand’s Kate Mcllroy (Specialized Women’s Racing) will also be one to watch, finishing 16 seconds down from the winner in last year’s event. It’s back to the Adelaide Hills for Stage 3, which features the same finishing circuit used by the men’s event. The final 5km features a deceptive climb from Aldgate into Stirling, which is sure to be a test for some tired legs. QOM points will be up grabs at Red Gum Hill at Greenhills Range (Category 3, 7% gradient), however with the downhill run into Mylor after that, many riders will likely find their way back to the peloton. Another uphill finish favours the exceptionally strong with local favourite and newly signed Mitchelton-Scott recruit Grace Brown, sure to catch eyes. Although finishing 3rd on this stage last year (also an uphill finish), Brown was able to break away from the peloton to take the third step on the podium, finishing less than a minute down from overall GC favourite Amanda Spratt (Mitchelton-Scott). Stage 4 features 25 laps of the Adelaide East End Circuit, with primes and cash prizes up for grabs on three laps. Clearly a race for the sprinters, Stage 4 will likely feature a hot pace from the get go, with less prominent teams vying for a breakaway. Although unlikely, if a breakaway forms, the win is anyone’s guess. In a bunch finish however, Mitchelton-Scott’s Sarah Roy will no doubt be among the top contenders, alongside fellow Aussie, Chloe Hosking (Ale Cippolini). Canadian Alison Jackson (Tibco-Sillicon Valley Bank) also made her mark this season in a number of dominant sprint finishes.